These are some of our favorite images we photographed recently, and their stories. Great pictures are made on both sides of the camera. I had this vision of a bride standing on a cliff, against a dark and cloudy sky. Her dress flattering in the wind, gazing out over the ocean. 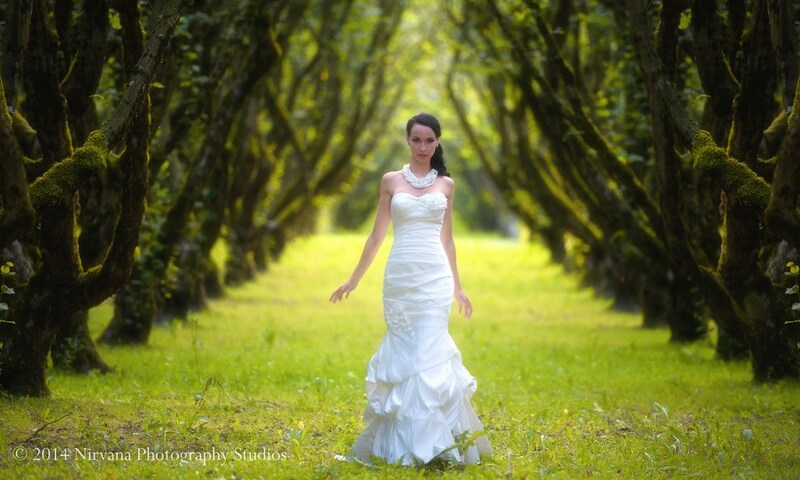 Stormy, moody, the bride illuminated by a single ray of sunlight breaking through the clouds. 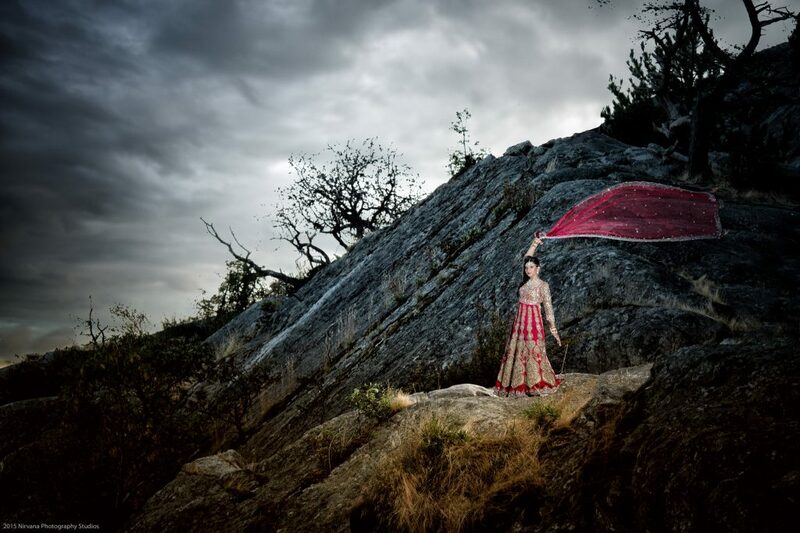 During a bridal photography session at Whytecliff Park, our bride Kalpana was willing to climb the cliff in her incredibly heavy wedding sari, and I simply love the result! Read the full story here. Photographed at Whytecliff Park, BC. Click to enlarge. Beautiful bride on a bed of roses. Shot at our Gastown Studio. Click to enlarge. This photo is still one of my favorites. 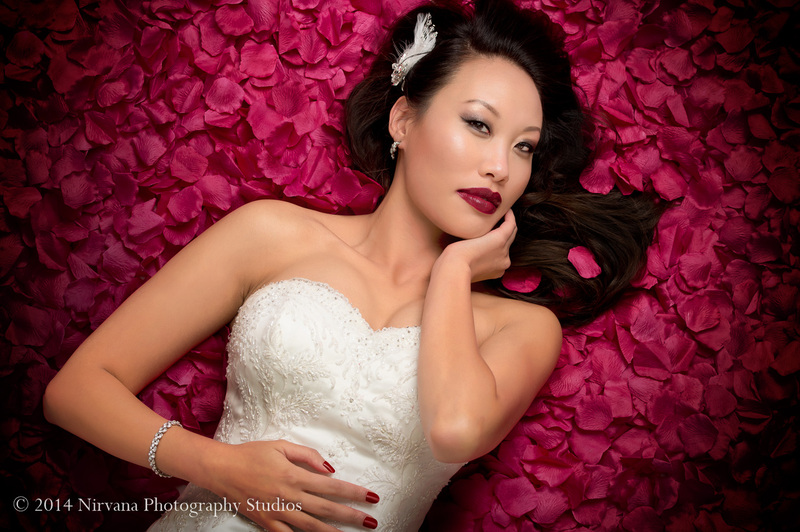 Inspired by a perfume ad I saw in Vogue magazine, I envisioned a bride, on a bed of roses. Bright! Bold! Fashion inspired. Magazine worthy. Two colors: Red and White. I love the result. The colors. Her eyes still draw me into the picture. Doesn’t she look absolutely amazing? On the way to our yearly retreat, we drove through Agassiz, BC. Beautiful country side! Hazelnuts are the big thing there. As we drove by this amazing orchard, I just had to stop. The tree branches formed this incredible, natural archway. it was immediately clear where I wanted to put the bride, the strobe, the light I wanted. Where is a bride when you need one? Two months down the road, Marylene was willing to take the drive with us. In my excitement, I packed strobes, light stands, camera gear, make up kit, smoke machine, reflectors… but forgot the bug spray. to this day, have some scars from the mosquito bites I got that afternoon, but – it was SO worth it. What do you think? Shot in Agassiz, BC. Click to enlarge. 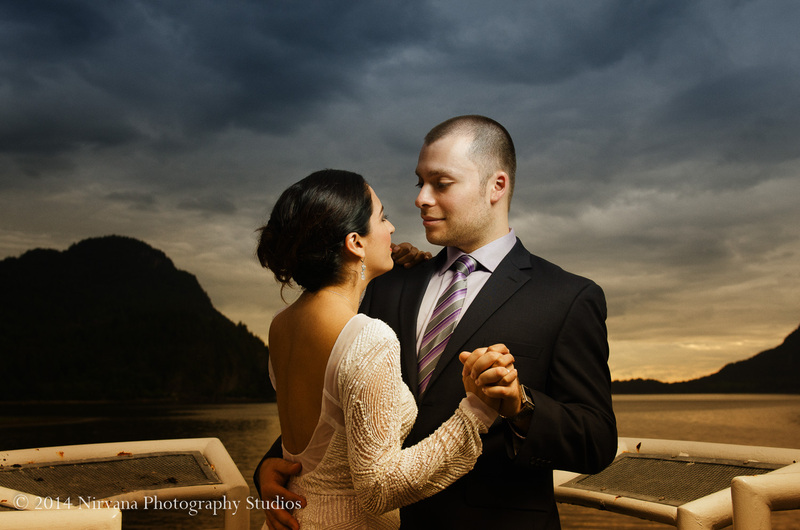 Wedding Photography at Porteau Cove Provincial Park, BC. 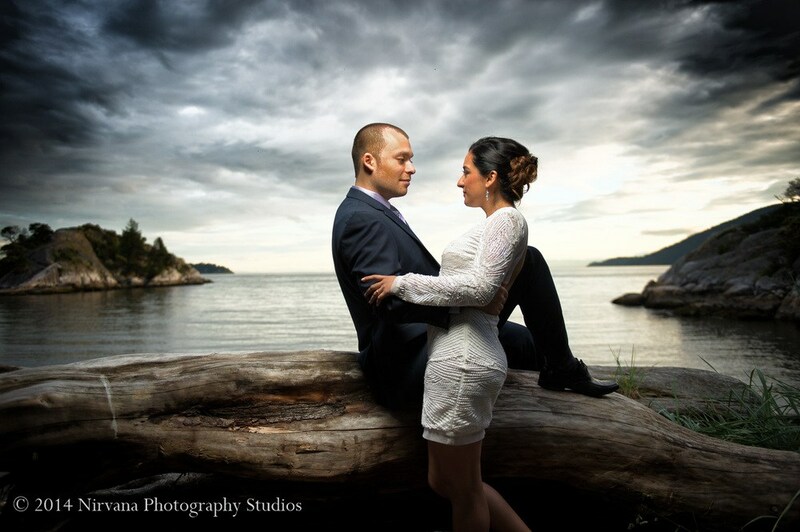 Our first Chilenian wedding couple, Marian and Angelo, wanted wedding shots representing the Canadian West Coast. Our plan was to first drive up the coast to Porteau Cove. This park is situated at the southernmost fjord in North America and features stunning, easily accessible views of the surrounding mountains and ocean. Coming from a hot country, the worst thing (in their mind) happened: It started raining as soon as we pulled into the parking lot. We made the best of it, and were rewarded with amazing, dramatic skies that made this picture a favorite of mine. I am not cheating – I love this picture as well, taken when driving back to the city with Maria and Angelo. As we are on the highway, the rain clouds were lit up by the setting sun. We turned the car around and pulled into Whytecliff Park, grabbed the lights, and set up at the beach, The very first image we took turned out to be the “money shot” of the night. Winter Bride, shot at our Gastown studio. Click to enlarge. 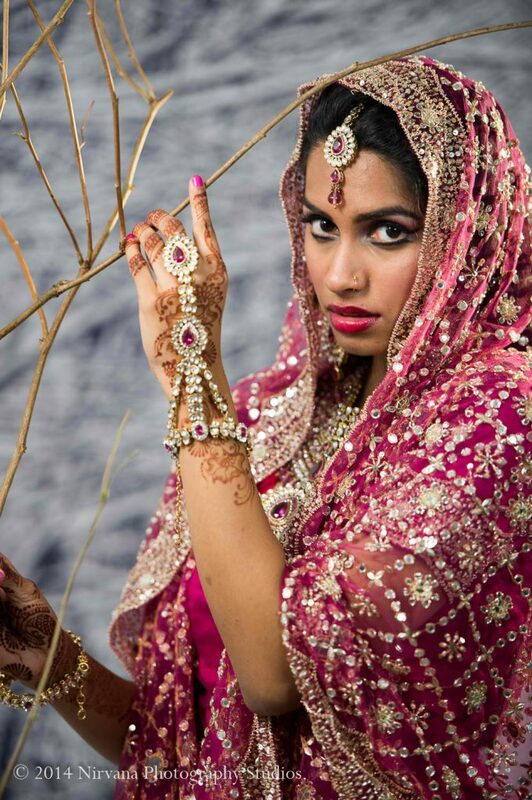 This was another one of the concepts I always wanted to try: A colorful Indian bride in a winter forest. First off, few Indian weddings are held in the midst of winter. Of those, I knew it would be difficult to get a bride to drag her beautiful (and expensive) wedding sari through the snow. Not to mention the mother of the bride would probably kill us.